Gerry Dawes's Spain: An Insider's Guide to Spanish Food, Wine, Culture and Travel: Spain’s Innovative Vangaurdia Cuisine vs. Traditional Down-Home Cooking, my article on the CIA-Worlds of Flavor website. Spain’s Innovative Vangaurdia Cuisine vs. Traditional Down-Home Cooking, my article on the CIA-Worlds of Flavor website. In 2003, The Sunday New York Times Magazine cover asked, “Is Spain the New France?” and carried Arthur Lubow’s “A Laboratory of Taste” article about elBulli’s Ferran Adrià, Spain’s ultra-modern cocina de vanguardia maestro. Adrià’s espuma de zanahorias (the Times cover shot of, a glowing red-orange carrot foam served in a crystal vessel); mango raviolis made to look like egg yolks: melon, pear and peach “caviars,” spherified “olives”; and nitrogen-frozen cocktails suddenly grabbed culinary headlines around the globe. Adrià and Spanish modern cuisine were propelled in the gastronomic stratosphere. Carrot "air" at El Bulli, October 2003. Photo by Gerry Dawes©2003. Contact gerrydawes@aol.com for publication rights. Accompanying Adrià’s rocket ride into another culinary dimension were plenty of skeptics and detractors who did not understand what was going on in Spain, claiming that the Spaniards were selling “flavored air” and that Adrià himself was destroying Spain’s “national cuisine.” But, since Spain’s culinary ascendancy, because of the fame of Ferran Adrià and a sizeable clan of like-minded fellow Spanish chefs, a whole new genre of modern food emerged–including modernized traditional cuisine – attracting a steady stream of international chefs, food writers and food aficionados to Spain, and in its wake an awareness that Spanish traditional cuisine was some of the best food on the planet. 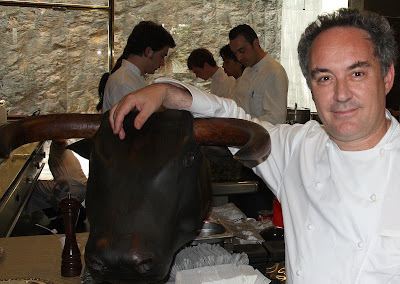 Ferran Adrià at El Bulli 2008. Photo by Gerry Dawes©2008. Contact gerrydawes@aol.com for publication rights. Since few gastronomic travelers coming to find out what all the fuss was about could actually get into elBulli–which has 2,000,000 annual requests for 8,000 potential reservations–the rest fanned out around the country, experiencing modern Spanish cuisine at Arzak, Akelarre and Martín Berasategui in the Basque Country, at Sergi Arola’s La Broche in Madrid, at Joan Roca’s Can Roca in Girona and at Carme Ruscalleda’s San Pau north of Barcelona. Many ventured on to experience what Raul Aleixandre at Ca Sento (Valencia), Quique Dacosta at El Poblet (Denia, Alicante) and María José San Roman at Monastrell (Alicante) were doing. Professionals also came to conferences such as Madrid Fusión (maybe the world’s top annual culinary summit), the chef-driven Lo Mejor de la Gastrónomía in San Sebastián and Roser Torras’s superb bi-annual BCN Vanguardia in Barcelona. And many young chefs began to choose Spain over France as their first choice to do their stages. In their travels these culinary pilgrims also began eating in Spanish traditional cuisine restaurants. They soon discovered that, while Spanish modern cuisine can be creative beyond belief and is often delicious as well as innovative, it is often the great traditional eating experiences that leave the most indelible imprint in the minds of most travelers. Guisantes (peas)--real or spherification, or both?--elBulli, 2008. Photo by Gerry Dawes©2010. Contact gerrydawes@aol.com for publication rights.